Skywatcher Bashar Alaeddin took this stunning image of star trails over the Wadi Rum desert from the south of Jordan on April 13, 2012. 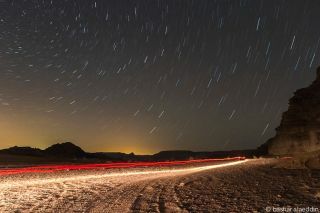 Dazzling star trails appear to spin over the Wadi Rum desert in this beautiful night sky photo. Stargazer and photographer Bashar Alaeddin took this image in the south of Jordan on April 14, 2012, and shared it with SPACE.com this month. "[This was] my first ever proper, sharp image of a star-trail," Alaeddin told SPACE.com in an email. "I was trying to aim for the North Star, but was a bit off as you can see, it's to the top left of the image." Alaeddin used a Canon 7D camera with a 17-55mm f/2.8 lens, settings set at 17mm, and f/5, ISO 320 for 722 seconds. The natural rotation of the Earth during the long exposure makes it appear as if a star is leaving a trail in the sky. Star trails can be shot by opening the shutter at a time exposure of 30 seconds and taking several images. These can be later stacked together to make a composite photo. In this image, the trails appear to stop at a line in the horizon because they fall behind the clouds. Editor's note:If you have an amazing night sky you'd like to share for a possible story or image gallery, please contact managing editor Tariq Malik at spacephotos@space.com.